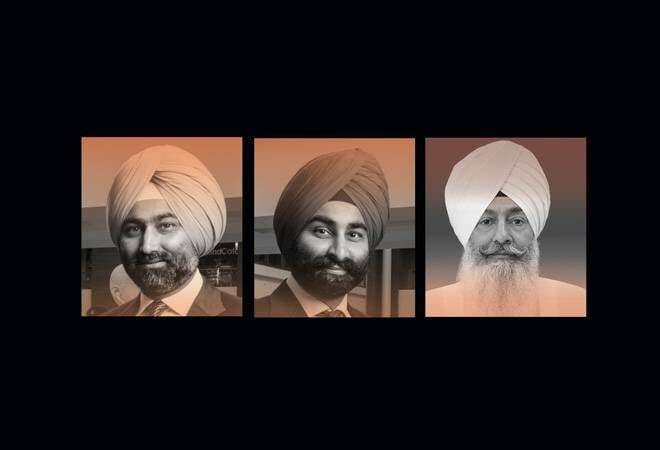 Business chatter has been abuzz ever since brothers Malvinder and Shivinder Singh's debt pile of nearly Rs 13,000 crore came to light two years back. That was shocking considering that, as recently as June 2008, they had hit gold with Rs9,576 crore in cash from Japan's Daiichi Sankyo for the sale of India's then largest pharmaceuticals company Ranbaxy Laboratories-an inheritance from father Parvinder Singh. 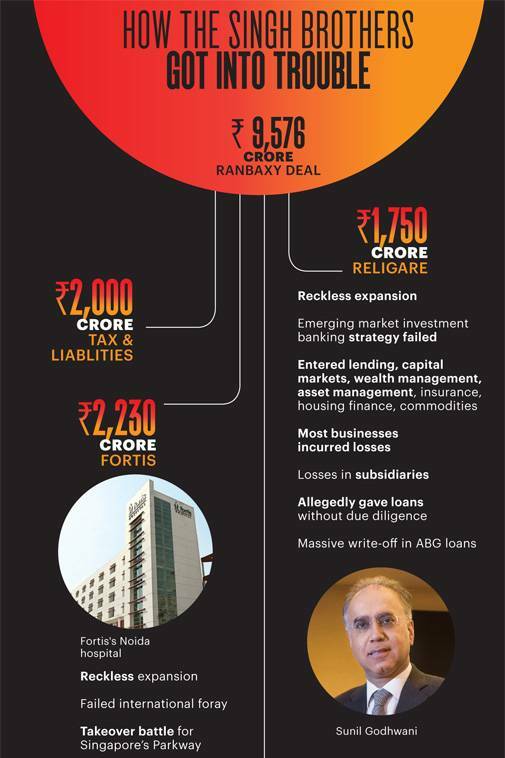 How could they squander Rs22,500 crore, lose control of prized possessions such as Fortis Healthcare, once the country's largest hospital chain, and one of the largest NBFCs Religare Enterprises-all in a span of less than a decade? Two years after the Singh-Daiichi deal, Ajay and Swati Piramal also sold their pharma business to Abbott Laboratories for Rs18,000 crore. They re-invested the money to build assets worth Rs25,000 crore in just the listed companies across realty, finance and pharmaceutical research. For long, the Singh brothers kept their fall from grace a closely guarded secret, avoiding meetings and discussions on the topic. But, for the first time ever, here is the inside story of how the brothers not just lost their wealth but also their companies and reputation. "Today we have lost control of all our key businesses - Fortis, SRL and Religare in our committed effort to repay our debts and also as a result of invocation of pledged shares by the banks. This has ultimately led to insignificant shareholding remaining with us in these businesses," Malvinder and Shivinder Singh said in a joint email response to our questions. Such decimation of a flourishing and diversified empire within a decade is unprecedented in India's corporate history. So, how did this happen? There began a vicious cycle of mortgaging assets and equity in group companies to raise loans to pay off previous liabilities. RoC records show that between 2008 and 2016, group holding companies RHC Holding and Oscar Investments pledged immovable properties and shares valued at up to Rs15,276 crore to various banks and financial institutions, including to Nimmi Singh, to raise resources between them. Of these, just RHC's pledges (some of which may have been to raise resources to pay off previous loans) starting November 8, 2010, add up to an astounding Rs12,800 crore. RHC Holding and Oscar Investments, which had debt of barely Rs15 crore and Rs60 crore, respectively, in March 2009, had total outstanding debt of Rs4,063 crore and Rs840 crore in March 2016 & March 2017, respectively (the latest data available with RoC). As they scrambled to pay off debts, the Singh brothers' resolution efforts were blocked multiple times by Daiichi Sankyo through court-led interventions to ensure the brothers had enough assets to pay off the $500 million arbitration order it had won against them. 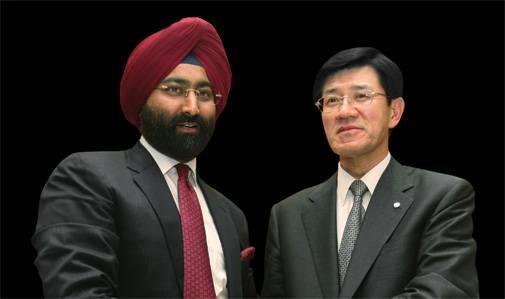 Daiichi Sankyo had accused the Singh brothers of concealing crucial information during the sale of Ranbaxy. Singhs have contested this claim. The order is currently reserved by Court of Appeals in Singapore and is expected anytime now. As they moved to settle their dues by selling assets in group companies, Daiichi Sankyo moved court to protect its interest by securing several injunctions preventing them from divesting their assets or equity. In the last hearing of the case on August 10, the Delhi High Court froze all bank accounts of the brothers alleging they misled the courts. Starved of cash, businesses went into a tailspin. Since debt remained unpaid and the value of the pledged shares dropped due to build-up of losses at Fortis and Religare, the lenders invoked hypothecation. Promoter holding in the two key companies, Fortis and Religare, which was 63 per cent and 72 per cent, fell to 0.6 per cent and 1.5 per cent, respectively. The Singhs lost control and stepped down from both the firms in February 2018. While Fortis will now be owned by Malaysia's IHH Healthcare, which has emerged as the highest bidder, Religare is controlled by PE firm Bay Capital. "Given the circumstances and immense challenges facing us today, we assure all our stakeholders that we are doing whatever it takes to resolve the issues and will not shy away from our current responsibilities. We have been constantly making all possible efforts to clear our liabilities. Unfortunately, the adverse ruling by the Delhi High Court and the Hon'ble Supreme Court of India in the Daiichi Sankyo arbitration case, compounded the problems, resulting in severe liquidity pressures, which has triggered unanticipated defaults with banks and lenders. Such large and complex matters will need time," says the Singh brothers' response. 'Prius Platinum, Ground Floor, D3, District Centre, Saket, New Delhi-110017' could pass off as a nondescript address. Until you notice a striking similarity: Company after company registering it as their official address in the RoC records. At least 16 at last count. Many of them have even declared the same email ID in the RoC records: cs.gysgroup@gmail.com; and are also being audited by the same firm. Sunil Naraindas Godhwani is no ordinary man. A follower of the sect, Godhwani was set to be sect head Dhillon's in-law as his daughter Simran was to marry Dhillon's younger son Gurkirat. The Godhwani family ran a leather business and had been known to the Singhs for two generations. He was backed by the Dhillons (who owned over 13 per cent of the company) to run Religare (earlier called Fortis Finance) in 2001. Godhwani dreamt big. He strategised to make Religare a global financial powerhouse as the firm expanded rapidly into lending (Religare Finvest), capital markets (Religare Securities), wealth management (Religare Wealth Management), asset management, insurance, housing finance as well as commodities. Its 2007 IPO, which was offered at Rs185 per share, listed at a premium and even shot past Rs500 a share before the global financial bust in 2008. Religare Enterprises had revenues of Rs896 crore, net profit of Rs91 crore and a market cap of Rs2,819 crore at the time of the Ranbaxy deal. From there it peaked to a consolidated revenue of Rs4,502 crore (March 2016), net profit of Rs320 crore (March 2015) and a marketcap of Rs6,762 crore (March 2011). Most crucially, the growth was heavily debt-funded. 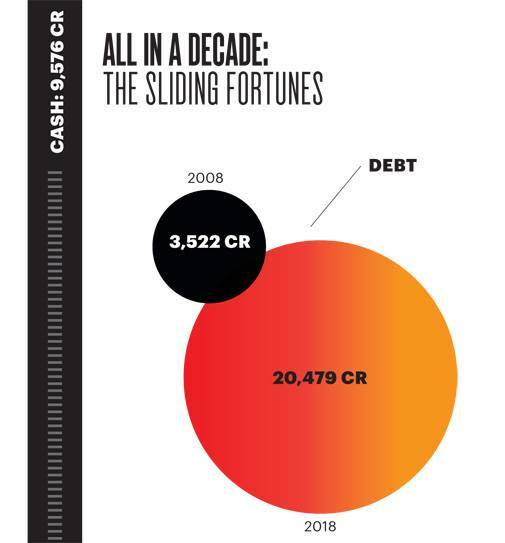 Its total debt shot up nearly 16 times from Rs1,272 crore in 2008/09 right after the Ranbaxy deal to over Rs20,222 crore by the end of March 2016. By its very nature, financial services business needs to raise debt to lend further. However, clearly Religare's debt burden had gone out of hand, over-shooting revenue and profit growth. Religare was now paying nine times the annual interest of Rs1,698 crore in 2017 as against Rs182 crore in 2008. 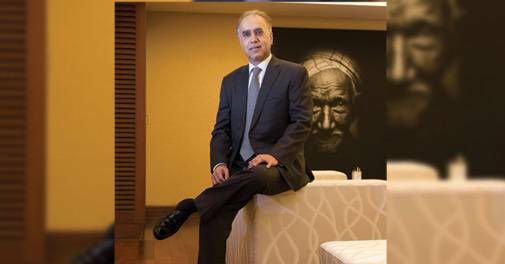 Though several businesses were losing money, the biggest drain on Religare were subsidiaries Religare Capital Markets and Ligare Aviation; the latter was run by Godhwani's brother Sanjay Godhwani. Ligare reported net losses of Rs590 crore between 2008 and 2014, the last reported results. 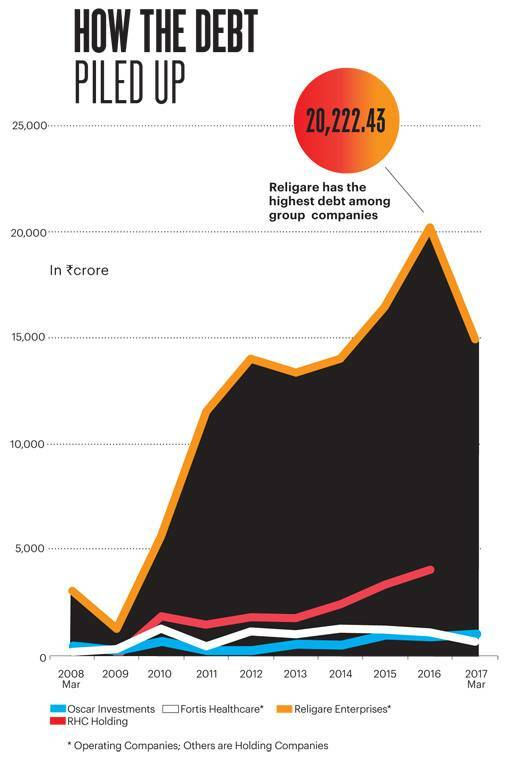 The debt on Ligare's balance sheet shot up from Rs3.85 crore in 2007 to Rs730 crore in 2010. The other drain, Religare Capital Markets, reported losses worth Rs1,628 crore between 2011 and 2016 (the last reported). Lending arm Religare Finvest also reported a net loss of Rs350 crore in 2016/17 while its debt shot up from Rs1,695 crore in 2008 to Rs17,218 crore in 2016. During 2008/18, for the 10 Fortis subsidiaries and eight Religare subsidiaries whose data has been filed with RoC, Religare subsidiaries reported losses worth Rs2,047 crore and Fortis subsidiaries Rs650 crore. At the consolidated level, the company went into the red soon after. From a net profit of Rs92 crore in 2008, it reported net losses of Rs295 crore, Rs149 crore and Rs481 crore between 2010/11 & 2012/13. This was followed by three years of profits and then another Rs123 crore loss in 2016/17. Religare is now under the regulatory lens. In 2016, the Reserve Bank of India, or RBI, reprimanded Religare's lending firm, Religare Finvest, for Rs1,200 crore worth of loans given without due diligence. Singh brothers have alleged that besides Religare, the entire network of investment companies as well as funds in their own holding firms, Oscar and RHC Holding, were managed and operated by Sunil Godhwani independently. Sources close to Godhwani, however, say the brothers were informed of every move and they signed on most of the documents. Investment and routing of funds is a major bone of contention now and may be a precursor to a possible legal battle in the near future. One of the sore points between the Singhs and Godhwani was Godhwani's failed commitment to the Singhs to secure a bank licence. Religare's application was rejected by regulator RBI. While the Singhs are believed to have blamed Godhwani, the latter blamed it on the Singhs saying Daiichi Sankyo's allegations after the Ranbaxy deal scuttled his chances of securing the bank licence. It widened the rift. Meanwhile, investor pressure built up. In July, 2017, ratings firm India Ratings & Research put Religare Enterprises, Religare Finvest and Religare Housing Development Finance on negative rating watch list. It also downgraded the holding company, RHC Holding, to default. Earlier, another ratings firm, Care Ratings, had downgraded Religare Finvest and placed it on credit watch citing corporate governance and disclosure observations. "The ability of the company to timely execute the strategic sale of its assets and eliminate the exposure to its corporate loan book, grow its loan portfolio and improve its profitability while improving its asset quality are the key rating sensitivities," the Care Ratings report said. Matters came to a head in November 2016 when subsidiary Religare Finvest had to write off Rs794 crore due to non-receipt of dues from Strategic Credit Capital associated with ABG Shipyard. The loan and the write-off is under regulatory scrutiny. Another entity, Religare Corporate Services, fully owned by RHC Holdings, was set up in September 2011. It has consistently incurred net losses worth Rs843 crore in five years between 2011/12 and 2015/16, the last data available with RoC. Yet another controversial proposal was Religare Enterprises' plan to sell its health insurance business for nearly Rs1,100 crore. Of that, it proposed to pay Rs500 crore to Religare Capital Markets, which was to pass this to its Mauritius arm Religare Capital Markets International Mauritius. It is this firm that had borrowed the amount from Axis Bank. Religare Enterprises, in turn, planned to write off the amount since Religare Capital Markets was incurring losses. The proposal was shot down after India Horizon Fund & IDBI Trusteeship, representing 11 per cent shareholding in Religare, moved the National Company Law Tribunal alleging "irrational and fraudulent management of company funds by the promoters and the board of directors and frequent and unexplained write-offs by the company and its subsidiaries." The Singh brothers, who had not been on the board of Religare since April 2010, returned after the write-off. The disagreements finally led to Godhwani stepping down as CMD in July 2016 and exiting the company in September, 2017. But the brothers stint was shortlived. They lost control of Religare in February 2018 once lenders invoked their shareholding against unpaid loans. "Religare is in the present situation due to the legacy issues of the previous management led by Mr. Sunil Godhwani. The serious mismanagement under this leadership drew the attention and intervention of the regulators," says a statement issued by Religare in February this year, just before the brothers lost control. Fair enough! Even if Religare's boom and bust cycle may be blamed on its then managing director & CEO Sunil Godhwani, what about Fortis, which was under direct executive management and control of the Singh brothers? Flash back to December 2015 when Shivinder resigned from the Fortis board to head to the Radha Soami Satsang in Beas. Fortis had grown to Rs828 crore in revenues and had reported its first net loss of Rs33 crore in six years in fiscal 2014/15. But by the time he delivered his first pravachan (discourse) at Beas in May 2017, Fortis was already a financial wreck. While he was going through his rigorous one-year induction at Beas, being transferred from one department to another, in late 2016, Rs473 crore was allegedly sucked out by the promoters from Fortis Hospitals (subsidiary of Fortis Healthcare) to pay debt in private holding companies. It was too massive a blow to the financials of a company whose total revenue is still in the sub-Rs1,000 crore region. A statement from Fortis later explained: "Fortis Hospitals?has deployed funds in secured short-term investments with companies in normal course of treasury operations. These entities?have become part of the promoter group due to a shareholding change in those entities. Subsequently, the same loans have been recognised as related party transactions?". But Fortis went into a cash crunch. Serious Frauds Investigation Office and Sebi are probing alleged financial irregularities under Singh brothers, including the charge that the promoters allegedly transferred Rs473 crore from the company without approvals. Singhs have claimed the money was given to a company that was not a related party when it was transferred but was subsequently acquired by the promoters and hence it became a related-party transaction. Shivinder is now believed to be back in Delhi sorting the group's financial mess. But Fortis had its golden run as well. As soon as the Ranbaxy proceeds were injected into Fortis Healthcare, its business went into a dream run. From revenue and net profit of Rs190 crore and Rs2.68 crore, respectively, it grew 2.5 times to Rs599 crore while profits shot up nine times to Rs24 crore by 2013/14. By 2012/13, Fortis had gone ahead of Apollo Hospitals as India's largest hospital chain by revenue (though Apollo reclaimed its top rank right after). Since then, it has reported losses of Rs34 crore, Rs40 crore and Rs75 crore in the following three years. A big reason why Fortis is in the red is the nearly Rs270 crore licence fee it pays to the RHT Trust in Singapore. RHT owns 12 of Fortis' clinical establishments and two hospitals (Delhi and Gurgaon). The Fortis acquisition deal by IHH requires buying out the RHT assets as well to eliminate the annual licence fee. What transpired in the interim was a phase of reckless global expansion across Singapore, Hong Kong, Australia, Vietnam and Dubai funded entirely through acquisitions of over $1 billion. Malvinder himself moved to Singapore to manage international operations. In 2010, Singhs even got into a takeover battle for Singapore's Parkway vis-a-vis Malaysia's sovereign fund Khazanah. The Singhs finally had to pull out and sell their stake in Parkway also to Khazanah. That was also the beginning of flipping the international acquisition and expansion strategy to focus entirely on the Indian market starting 2012-13. "Their M&A driven global expansion strategy was, perhaps, conceived without finer understanding of the complexities and challenges that come in the scale-up of such a plan. The time they took to roll out their expansion plans was perhaps too short," says Muralidharan Nair, partner, advisory, life sciences, Ernst & Young. In 2017 Fortis tried to buy back the assets of Singapore's RHT Trust which are located in India for Rs4,750 crore but met with opposition. The objective was to eliminate the annual licence fees. 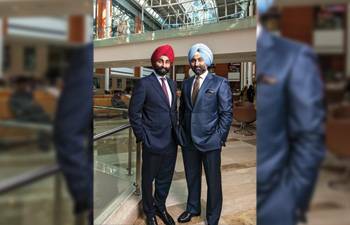 But by February 2018, the Singh brothers lost control of the company when lenders invoked their shareholding pledged with them against shares of Fortis. In the quarter ended March, 2018, Fortis reported a net loss of Rs914 crore. Of that, Rs834 crore was due to write-offs arising out of losses from advances, goodwill and inter-corporate deposits and other provisions. The pending resolution of the $500 million arbitration won by Daiichi-Sankyo remains a Sword of Damocles hanging over Singhss head. In case the final award (currently reserved by the Court of Appeals in Singapore) also goes against them, where will that money come from? "We have challenged the majority Arbitration Award in Singapore Courts and the hearing for the same has concluded. The matter is reserved for judgement. We maintain that there was no misrepresentation or concealment in the Ranbaxy deal to Daiichi Sankyo and these are false accusations made against us four years after Daiichi Sankyo bought Ranbaxy (after around 9-10 months of due-diligence). The products made by Ranbaxy had always been of good quality which even the US FDA maintained in their statements (US FDA Press Statement dt. Feb 25, 2009)," says the brothers' response. Singhs say that despite all the accusations by Daiichi Sankyo, Daiichi made a profit in 2015 (Rs223.30 crore from the sale of Ranbaxy to Sun Pharma; additionally Daiichi received benefits in the nature of interparty transfer of assets, dividends Rs53.74 crore, synergies in excess of Rs600 crore and tax benefits of over Rs8,000 crore amongst others). "Daiichi Sankyo since long has been making all possible efforts to try and sabotage the Fortis/SRL/Religare deal (blocking infusion of funds/equity and demerger). Their constant blocking of any economically accretive proposals goes to show that their objective and motive is not to secure their award but rather being vindictive in nature to hurt the larger stakeholders of our group. Their repeated actions have negatively impacted Indian banks, all our shareholders and employees. To date, the FDA has no evidence that these drugs do not meet their quality specifications and has not identified any health risks associated with currently marketed Ranbaxy products." With both the Dhillons and the Singh brothers refusing to respond to detailed questionnaires, it's hard to decipher what transpired in their business dealings. But l'affaire Dhillon-Singh leaves several unanswered questions: Were the brothers consumed by naivete in not just handing over a substantial chunk of their wealth to the Dhillon family and RSSB associates but also in giving Godhwani a free hand? Naivete is surely not one of their virtues. So why did the Singhs let it go this bad, this fast? Or, was the money actually owed to Dhillon family and associates? As a result, it was never returned! Singh brothers say: "Our immediate focus is to resolve all open issues and bring them to closure by repaying all debts and liabilities. We will continue to sell our assets in compliance with the court orders in order to clear all our debts. We as entrepreneurs created and built Fortis and SRL Diagnostics as leading healthcare institutions that they are today. We believe in the India growth story. After resolving the current issues and overcoming the present challenges, we will make all possible efforts to rebound, taking learnings from these difficult circumstances, and continue our entrepreneurial journey in India and be a part of the nation building exercise." "We would now like to fight for our Justice and Pride...and not for economics only," say the brothers in their response. Meanwhile, industry wonders how much bigger a hole will this dig for the Singhs before they can redeem themselves. With both Religare and Fortis slipping out of their hands, the brothers are believed to be operating out of one of the group's oldest offices at Hanuman Road while another office at Marina Building is readied. Marina is where their grandfather Bhai Mohan Singh began what would be a flourishing empire at its peak. It may just be the most auspicious location to reboot and restart.